"Both of my grandmothers made this salad every summer when their gardens produced baskets of cucumbers. It's a cool, fresh side dish for any meal. One of my grandmas omitted the green pepper and the celery seed. She also put ice in it to chill it quickly and cut the vinegar taste." 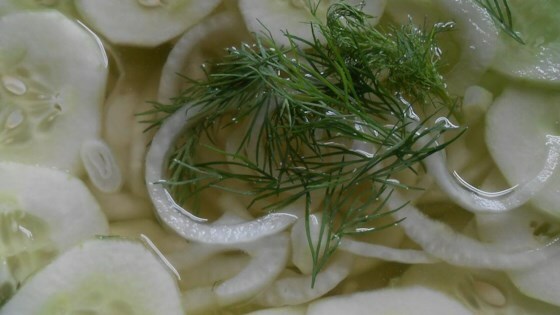 Place cucumber slices in a colander and liberally sprinkle salt over cucumbers; set aside until water starts to release from cucumbers, about 15 minutes. Drain and rinse cucumbers. Mix cucumbers, onions, and green bell pepper together in a bowl. Whisk sugar, vinegar, celery seed, and 2 teaspoons salt together in a bowl until dressing is smooth; pour over cucumber mixture and stir until evenly coated. I love this salad! I don't care for celery seed though, so the only thing I did differently was to swap it out for a little bit of fresh dill. So easy, so yummy! Instead of green peppers I added yellow and orange peppers and also for the added color I put in the purple onion. Not too hot and it tasted delicious. This recipe tastes exactly like my grandmothers cucumber salad. Since she passed I have tried to duplicate it or find one similar. This is spot on! We have made this twice now . first time I left out the celery seed. this time I added the seed and it was very good. I love this recipe. I made this for company and they loved it! I sliced my cucumbers and onions very thin, because that is how my husband like them, and these were a great addition to a summer meal.